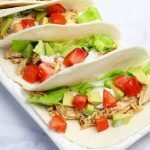 I’m as obsessed with Tex-Mex food as I am with my Instant Pot , which is why it should come as no surprise that these Instant Pot Salsa Verde Chicken Tacos are one of my favorite recipes. The green salsa is mild enough that the kids can eat it, especially since any spiciness is cut by the sweetness from the honey. 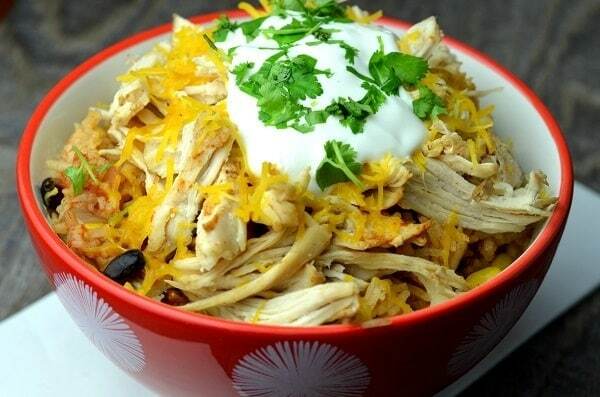 Like my Chicken Taco Bowls, this recipe is really easy to make. They are both Instant Pot chicken recipes that get used a lot in my home! If you don’t have an Instant Pot, don’t worry. I have instructions at the bottom of the post for making them in a slow cooker instead. Taco Tuesdays are standard in my house. It’s the one day of the week I don’t have to stress over what to make and that I can also count on everyone eating without complaints. But just because we have tacos every week doesn’t mean we follow the same boring recipe every time. 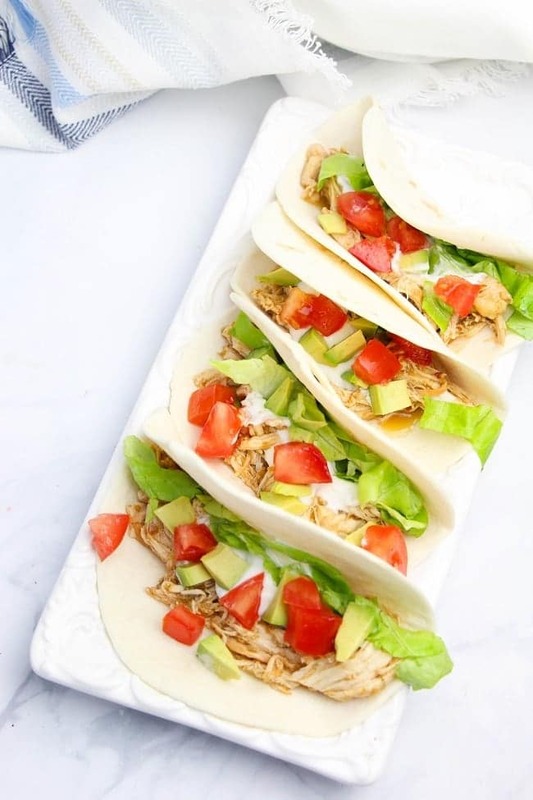 I love trying out new variations which is how I came up with these Instant Pot Salsa Verde Chicken Tacos. Normally, I’d break the recipe down into steps, but these chicken tacos are basically a dump meal. You just put everything in the Instant Pot and cook it! I’ll break down the order I add the ingredients just so you can see what it should look like as you prepare it, but really, it’s so easy. 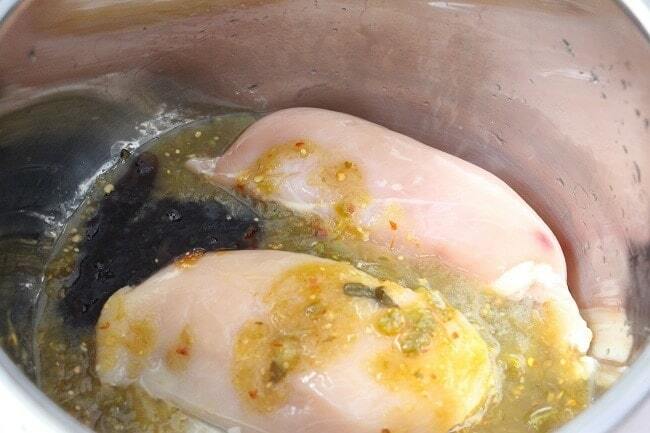 First, you put in the chicken breasts. Then you add the salsa verde, honey, and lime juice. Next, you sprinkle on the taco seasoning, paprika, salt and pepper. Then you cook on manual for 7 minutes (10 minutes if using frozen chicken). Let the pressure release naturally. When all of the pressure is released you can remove the lid and shred the chicken. You can sprinkle on some hot sauce and more seasoning if you want a little kick. 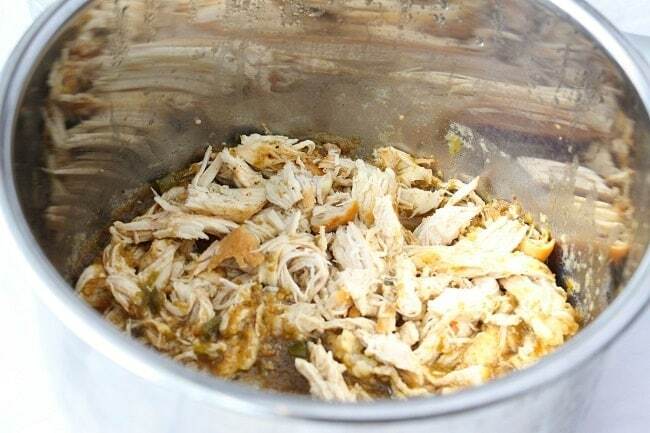 Now you just need to spoon some the chicken mixture into tortillas and add your favorite toppings. 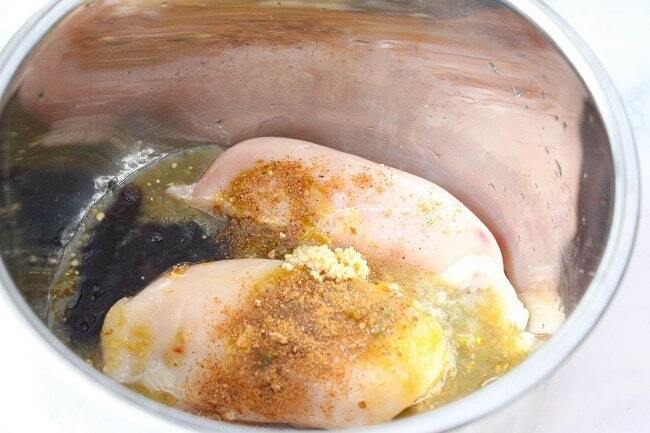 Place the chicken breasts in the Instant Pot. Pour over the salsa verde, honey and lime juice. Season with the taco seasoning, paprika, salt and pepper, ensuring even coverage of all chicken with the spices. Place the lid on the Instant Pot and seal. Cook for 7 minutes (10 if cooking from frozen) and allow to natural release. Shred the chicken with two forks, and add hot sauce and additional seasoning, to taste. 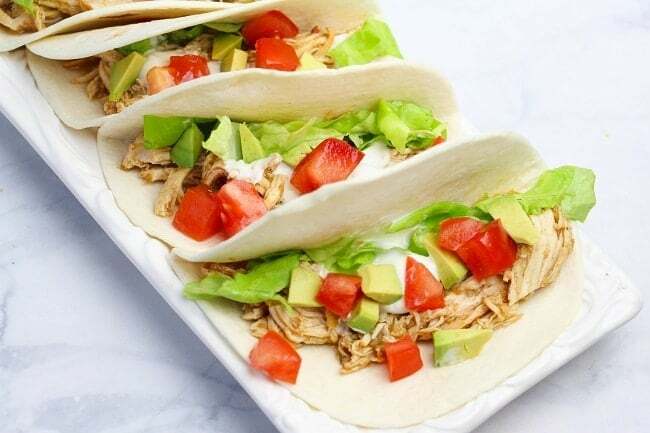 Serve 1/2 cup of the chicken on each soft taco, along with a sprinkle of lettuce, tomatoes, avocadoes and cilantro. No Instant Pot? No Problem! You can easily make this dish in a slow cooker. Instead of cooking the chicken in an Instant Pot , just add the chicken, salsa, honey, lime juice, seasoning and spices to your slow cooker. Cook 3-4 hours on high or 7-8 hours on low. Follow the directions above for shredding and serving. Do you love Taco Tuesday too? 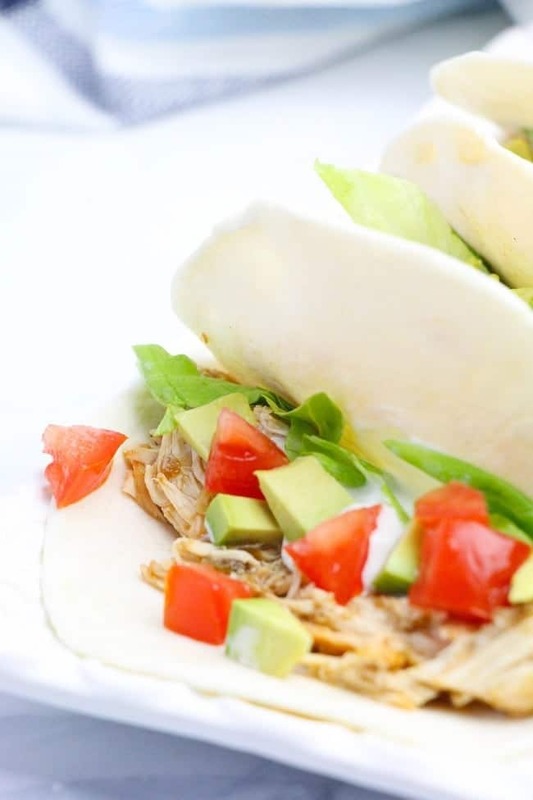 Try my Instant Pot Chicken Taco Bowls. It’s my most popular Instant Pot recipe. How much chicken was used for the recipe? Looks very delicious and I want to try it. 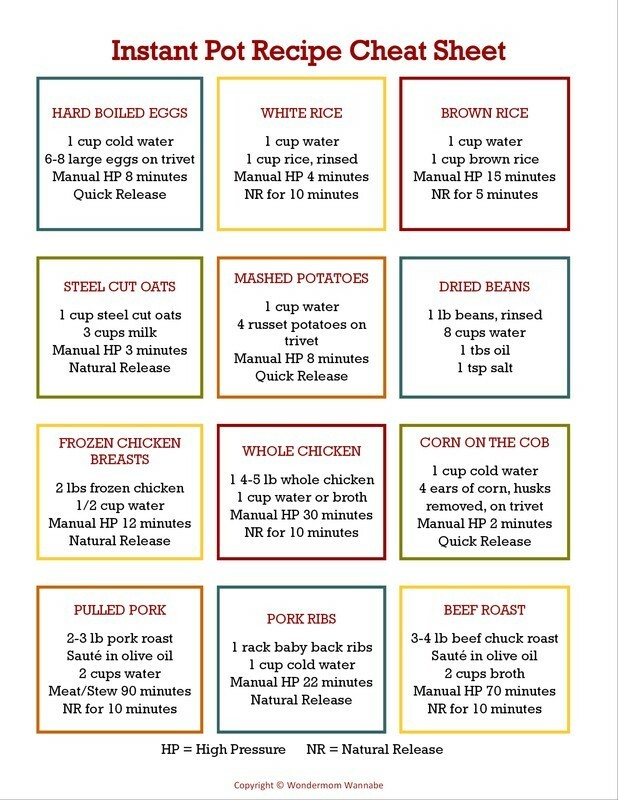 But how many pounds of chicken altogether do I need for this recipe?! The packs at my local grocery store are usually about 2 pounds.